Amazon Dynamo DB is a fully managed No SQL database service that provides fast and predictable performance with seamless scalability. With Dynamo DB, you can create database tables that can store and retrieve any amount of data, and serve any level of request traffic. In this blog , we will know how can we access Dynamo DB from Web Server and read the data from Dynamo DB table. 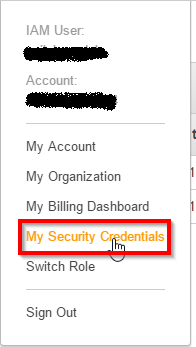 Step2 : Go To IAM Console and get the Dynamo DB Access Key and Secret Key from your own Account . Step3 : Go To Users and copy your Access Key and Secret Key . Step4 : Provide the AWS Config file and AWS Credentuials file. Go To Command Prompt and provide details. Step5 : Establish Connection from PyCharm and get the DynamoDb service to read the data. Now we will get the target service as dynamodb.ServiceResource(). Let's start coding to read the Dynamo Db data. If I want to get data of a particular user I would write the code as follows. 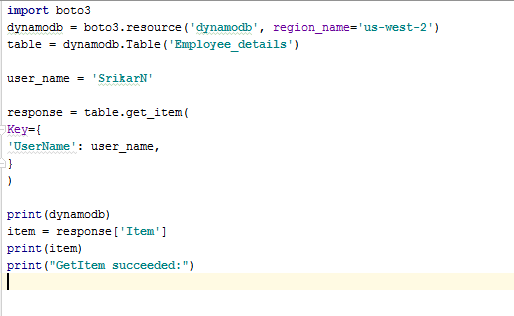 So this how you can read the data from the AWS DynamoDB Table .